Hawaii PG Pilots (aka Monkeys) join the last Rat Race put on by the Haley clan. Day 5: We get another late task start, so the day is short. The Sprinters are doing great with Flash holding down a top ten spot. Us Racers have a run around ending at Donatos house. JK has a good day but lands short of goal in the fading conditions near Jacksonville. I manage to finish ahead of him on leading points, not sure how that works. Day 6: High pressure remains and they start the race early. It quickly appears that conditions haven't turned on yet. Most of us eventually bomb out, but the leaders call a Level 3 and the task gets stopped. Funny thing is that charging super low in the leeside will usually find you in bad conditions. The guys who called Level 3 all flew the task. 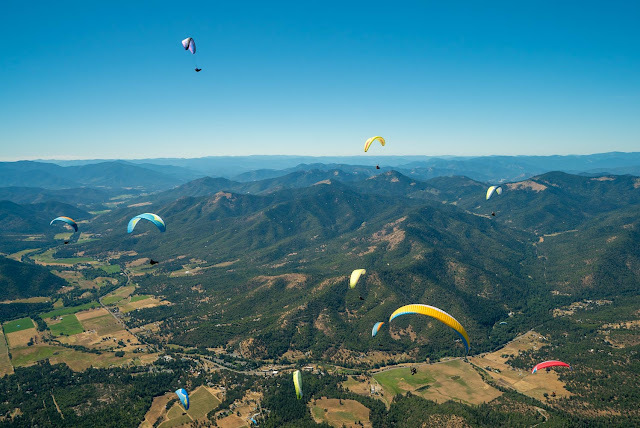 The Sprinters ignored the stopped Race and launched at the right time and had epic high flights up Applegate Valley. Day 7: Another late start, the Race had a fairly challenging course. Finally we got high, 9600'. The day turned off before most of us could finish the last leg into goal. The tasks weren't long this week, but they were definitely challenging none the less. A big party followed, kind of emotional as it was the Haleys last Rat Race and possibly the final edition. Results- Race 1 Kansas, 2 Brad, 3 Jared, 23 Igor, 52 Dave, 62 JK, 77 Scrappy. A great time and a great Monkey party as well. Fun, eventful, day in the sprint race. Probably deserves more of a writeup than I have energy for right now, but here are some pictures from another great day of flying. The start gaggle above launch for the sprint race. Day 3 had lots going on, I will just give teasers here. The Sprint saw Drews brother Eddie 8th in goal, Drew made it, as did Flash in the most remarkable way. In the launch gaggle he takes a frontal which rips open the center bottom surface of his Alpina. He heads towards Hunter LZ cautiously ready to throw his reserve if needed. On the way there he decided the glider still works okay, thermals up for the start and flies all the way to goal. Remarkable. Everyone else had varying results. I made goal at Emigrant Lake, but we had a mandatory 6000' ceiling for Medford airspace and I hit the mark too high and lost a third of my days score. On arrival at the goal LZ Krista Auerbach had a hard landing and got hurt pretty bad, hope not too bad. Also there was a hard landing resulting in a broken ankle, and some reserve tosses. A busy day for sure. Sunny, cloudless and high pressure. It is definitely summer. Day 1 of the Rat Race included a twin engine plane slaloming through the gaggle, a whole lot of people in goal and an unfortunate reserve toss with serious injuries in a remote area. The high pressure and north wind delayed the task and put everyone on a fish bowl task. Day 2 had similar weather, but less north. The Sprinters stayed in the valley with Kauai Joe coming in 6th, with most of the guys on goal. None of the Hawaii Racers made goal, including Igor, but not for lack of trying. A pretty tough course from Grant Pass to Donatos house, with mid airs and tree landings, but not our guys. Getting really late, but I wanted to post a couple of pics. Maybe someone else can write up a more detailed recap of today. JJ? 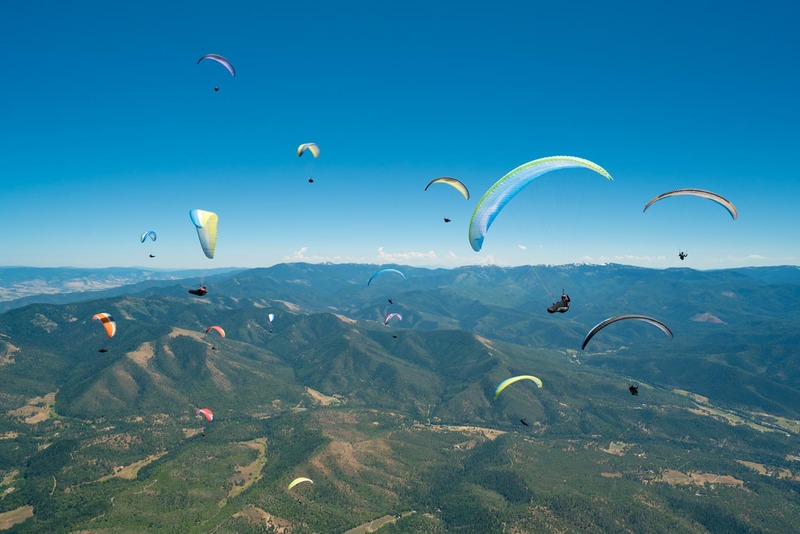 After some serious parawaiting in the searing heat, the day turned on and we were released into the air. It was awesome to be flying with so many gliders in tight gaggles. I wasn't planning on flying in this year's Rat Race, but when I started going through my pictures from last year and reliving all the great memories, I decided I couldn't miss out on the fun. So here are some of my favorites. I hope seeing these pictures will get you guys as excited about heading back to Ruch as I am. Last year was my first time competing and I went from being nervous about flying with a bunch of hotshot pilots to really enjoying flying wingtip to wingtip, racing to the next waypoint in a giant gaggle.